My brother and sister-in-law recently moved into their new condo. The best part, though, is that they live closer to me. I think we’ve been able to see each other more often this past month than I have during the past year. As I said, I invited them over for dinner and giggled as I planned my menu. I nonchalantly pointed out that I didn’t want to cook in this atrocious heat so I would make tacos. I told them to come with an open mind and a hungry belly! You see, I wanted to make raw tacos. A few weeks ago, Rob and I had a celebratory dinner at Raw Aura, where we were blown away by the food. In particular, we devoured the raw nachos which included corn chips with guacamole, cashew sour cream, fresh tomato salsa and walnut taco meat. It doesn’t sound that exciting, but it was delicious. The corn chips had so many levels of flavour, the cherry tomatoes were so fresh, the sour cream so creamy, and the walnut meat.. let’s just say I was blown away that it was made from walnuts, which I don’t typically like. The flavours were impeccable. I wanted to try to make it myself. I remembered seeing Sarah’s post for post for raw tacos, so I was eager to try my hand at something new. So what exactly are raw tacos? The main component is the “meat” which is simply coarsely chopped walnuts with cumin, chili flakes, tamari and a bit of oil. Super simple to whip together in a food processor. My brother snuck some before it was served and exclaimed, “This tastes like taco!”. The walnuts are really a vector for the seasonings (aka a heavy dose of cumin and soy sauce) and in this case, I thought the meat itself was a bit salty when eaten solo. Combined with the rest of the ingredients, though, it worked wonderfully. 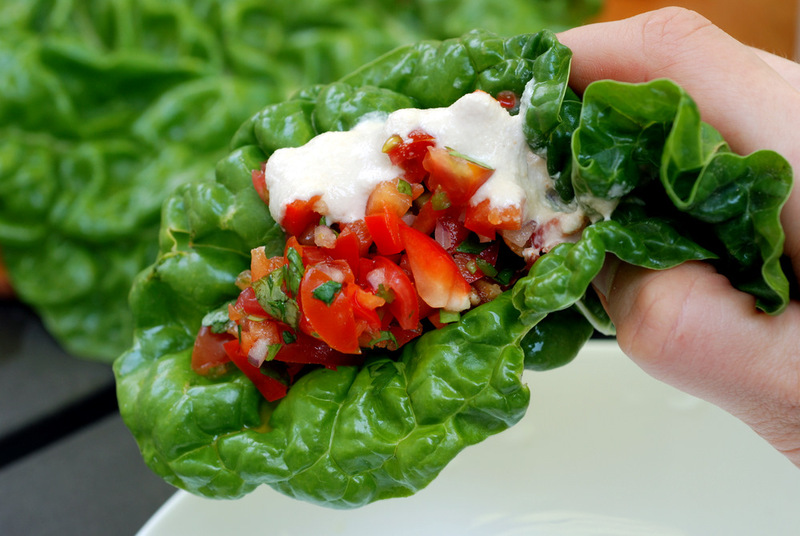 I also whipped together a cashew sour cream with lemon juice, and a delightful cherry tomato salsa (my favourite part of the wrap). I used Swiss chard leaves to eat my tacos, but had tortillas for my guests. The tacos were a hit! The walnut meat was devoured. None left. You can tell Mom everything tasted great. I was worried they may have turned up their noses if they knew they were going to eat raw food, but as they pointed out – it wasn’t like I was going to feed them raw eggs or meat, so they weren’t phased in the slightest. For the record, these tacos were great, but not nearly as fantastic as those at Raw Aura. It just gives me more incentive to go back to the resto. At least it is closer than Thrive Juice Bar in Waterloo, which is my other favourite restaurant. This is being submitted to this week’s Weekend Herb Blogging, hosted by Simona from Briciole and to this week’s potluck party for raw foods. 1. 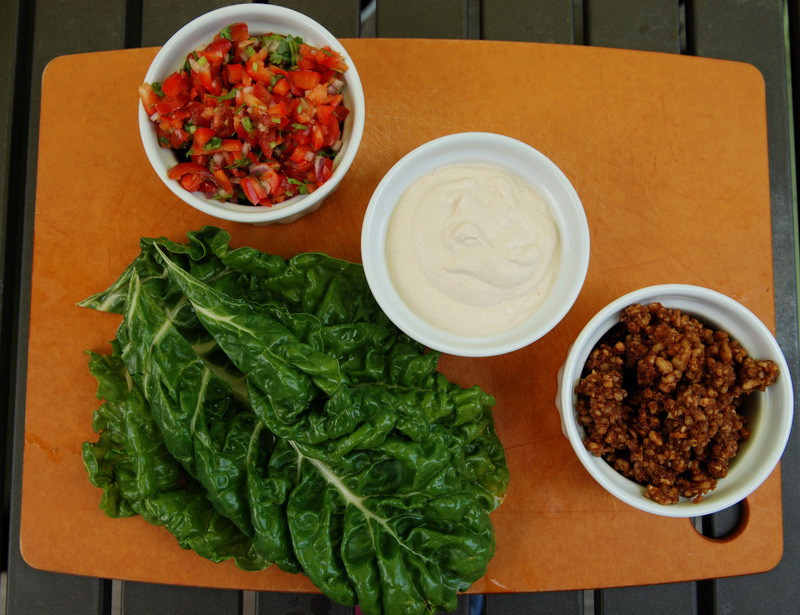 Remove stem from Swiss chard and top with walnut meat, salsa, sour cream and avocado. Garnish with extra cilantro. Wrap and eat! 1. Whisk the garlic, lime juice, honey or agave, olive oil and sea salt in the bottom of a bowl and set aside. Jinx! I did the same walnut meat post today. I can’t remember if I told you I made them but I loved them!!!!! I did mine with mango salsa. Your photos are better though. I didn’t get to being very creative with a hungry family at the table. I guess I should be thankful I got the one! oh my goodness! i love lettuce-type wraps..and i love walnuts in everything. i feel like we have the same taste in food 😉 i need to make these! 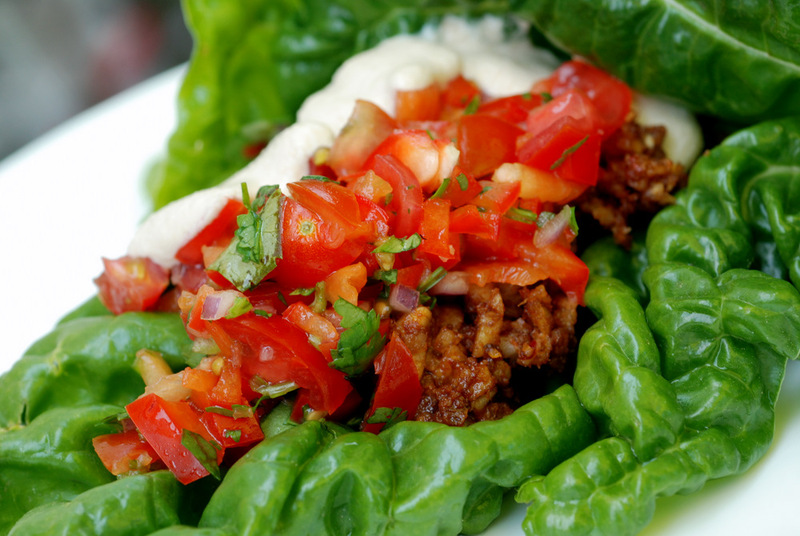 OMG I’ve got to try this walnut taco meat thing, it sounds amazing. I love new things!! Sounds great! Though, I think rather than a lettuce wrap I’d like to try it with a tortilla of some sort… something similar maybe to the corn chips you mentioned, just tortilla size – I assume they were dehydrated? It’s so great that you’ve been seeing more of your brother lately! Mine is moving into manhattan in two weeks and I’m super excited about it! I don’t think I’ve ever had anything explicitly raw like this before, but that walnut meat sounds so tasty! I’ve made a similar raw dish – I used the recipe in one of Ani Phyo’s cookbooks. I used Romaine leaves for the ‘shell’ and, yes, the tacos were fantastic. Now I’m craving them again…..
I’ve tried one recipe for a raw corn chip and it didn’t turn out so great. Not worth the prep and dehydrating time. What an interesting post! I am very intrigued by the various component of your raw tacos. I am glad the guests appreciated the meal. Beautiful colors too. Thanks for contributing to WHB! 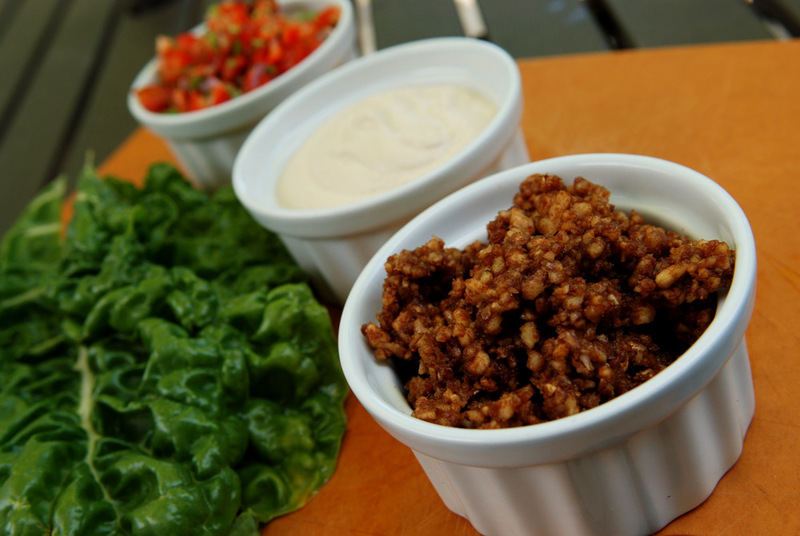 Love the walnut taco meat idea. The more vegetarian cooking I do, the more I find that certain dishes really do come down to the spices. Doesn’t really matter if you’re putting them on meat or something else. Your tacos look lovely, great photos. I made this for my in-laws the other day and the first thing they said was ‘Wow! This tastes like a real taco!’ They’re even going to make them for their vegetarian friends. By the way, for those who aren’t vegan and need cheese on their tacos, a couple thin slices of applewood smoked cheddar are most excellent to tone down the saltiness of the walnut meat. Yum. 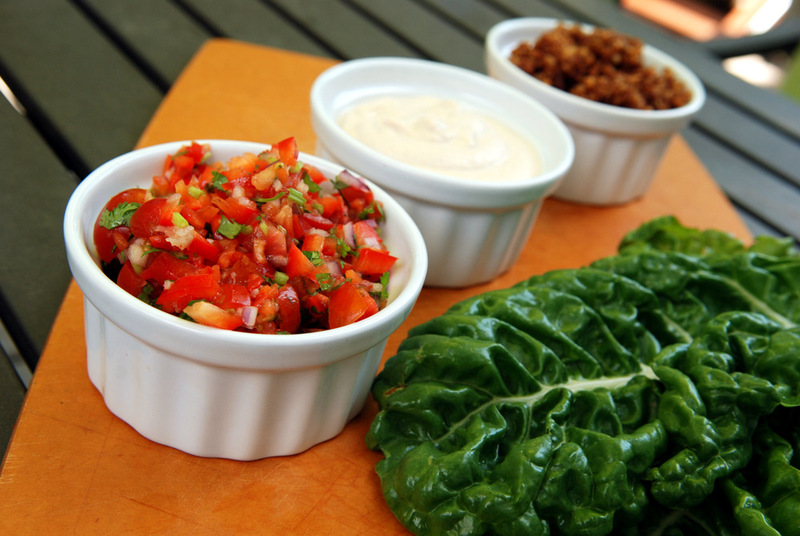 PS – That Swiss chard looks so perfect and pillowy. Ahh I love fresh perfect veggies! My first raw recipe! Absolutely terrific. I used rainbow Swiss chard, which made it gorgeous. Your blog is incredible. The photos are gorgeous, writing topnotch, and recipes look amazing—lots of grains (you definitely like quinoa, don’t you? ), veggies, etc. Hi, I’ve never had raw food (except fresh veggies and fruits, lol). I am a bit hesitant about walnut taco meat…does it taste crunchy? Amazing!!! We love these so much! Thanks for sharing!! !